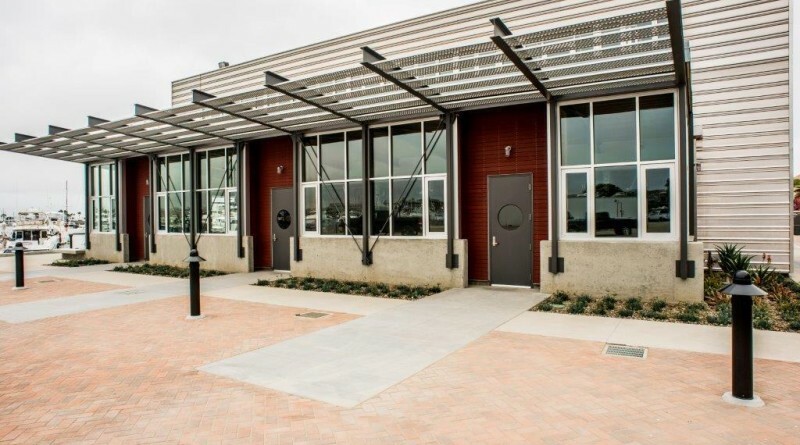 SAN DIEGO — A ribbon cutting was held Aug. 5 to celebrate the completion of a new building as part of the Intrepid Landing development on the Port of San Diego’s waterfront between America’s Cup Harbor and Shelter Island. The new building is located at 2805 Dickens Street and is the first of three buildings in the Intrepid Landing development. A two-story structure constructed of red cedar and steel, the building totals 4,800 square feet. Space within the building is now available for lease, with priority given to marine sales and services businesses. The development is a partnership of Driscoll, Inc. and United Development Group, Inc.
Intrepid Landing was designed by Miller Hull, a world-renowned architectural firm that also designed the Pier 32 Marina in National City and the Point Loma Marina in America’s Cup Harbor. The developer is investing a total of $6.3 million in the waterfront development, which includes a 40-slip marina and public promenade connecting Shelter Island to Harbor Drive, both completed in 2013. The next phase of development includes two more buildings. Completion is expected in the second half of 2016.